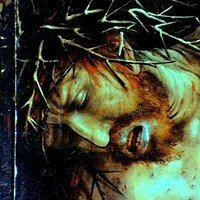 History, Types, Famous Altarpieces, Icons. The term 'panel painting' denotes a picture painted on a panel (either a one-piece or multi-piece panel), usually made of wood, although metal and other rigid materials are used. Until canvas became popular in the sixteenth century, most movable paintings in Europe (viz, excluding murals or artworks on vellum) were created on panels. Indeed, right up until 1600, panels were as common as canvases. They were especially popular with painters producing altarpiece art and miniatures, who might use wood or copper (even slate) panels. Panel paintings used over the altar typically came in three formats: diptych (2-panel works), triptych (3-panel works), and large-scale polyptych (multi-panel works). The preference of most Italian Old Masters was white poplar, while Dutch, Flemish and other northern European painters tended to use oak. Other types of panel wood included: beech, cedar, chestnut, fir, larch, mahogany, spruce, teak and walnut. Among modern artists, synthetic materials like fibre-board and plywood, are popular. The basic preparatory technique involved seasoned wood, planed and sanded, then coated with 'size' (an admixture of gelatin or glue made from animal skins) after which up to 15 layers of gesso (a white absorbent ground for painting in tempera or oil, made from chalk mixed with glue) would be applied to produce a hard smooth surface. After this, the artist drew a freehand design or drawing, typically in charcoal, before applying paint. The actual painting might be done using the encaustic (Byzantine panels), tempera (Italian Renaissance panels) or oil (Dutch/Flemish panels) method. Panels were used in Western medieval painting from about 1000 CE, notably in the creation of church altarpieces. 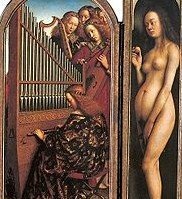 The Sienese School of painting (led by Duccio di Buoninsegna) and the School of Flemish painting (led by Robert Campin, the Van Eyck brothers and Roger van der Weyden), were both heavy users of wood panels. Overall, the Northern Renaissance painters - especially those of the Netherlandish Renaissance and German Renaissance - tended to use oil on panels while southern artists in Italy during the Early Renaissance era tended to use fresco, or tempera on panel, and less oils. 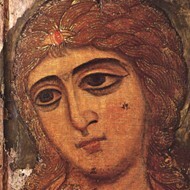 Eastern Orthodox artists in Russia, Constantinople and the Levant area also used panels for their religious paintings - nearly all of which were icons. Sadly most have since been destroyed. New attitudes, greater prosperity, and changes in art practices, led to canvas displacing wood as the most popular medium - a process beginning about 1500 and championed by Venetian artists like Andrea Mantegna: not least because Venice was the foremost source of quality canvases. This process of change occured almost 100 years later in Northern Europe, where panel painting remained more popular among Old Masters like Rubens due to the greater precision it provided. Many other Northern European painters, especially Flemish painters and also Dutch Realist artists of the Dutch Baroque, used panels for their smaller works and miniatures, as did the Spanish painter Goya. For details of colour pigments, along with hues and other dyes used in panel paintings through the ages, see: Colour in Painting.  For more about different types of painted panels, see: Homepage.